While Clark Kent paces nervously awaiting news of Der Teufel, a military policeman recalls meeting the disguised Der Teufel and goes to investigate at Gottfried’s Inn, but it’s too late. Professor Milch has already succeeded in converting the kryptonite fragment into a liquid state. 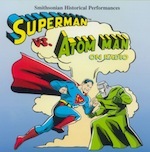 Who will become the world’s first Atom Man?